Designed, tested and proven with the best athletes in the world, the Madshus Redline Nordic Ski Series establishes a new standard for speed. A long, low camber style with exceptional carrying capacity from 0° and colder. 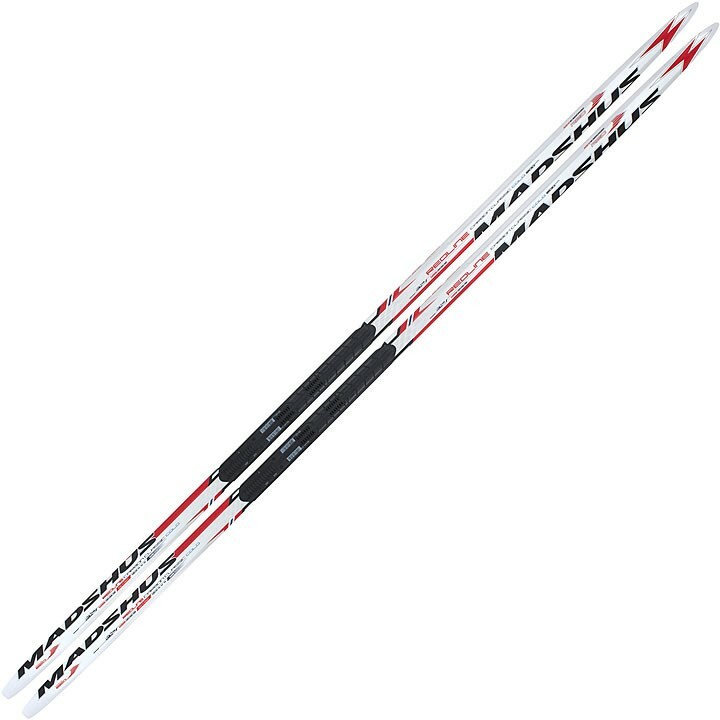 The Redline Carbon Classic cross country ski has a slight splay in the tip and tail for minimal snow resistance and improved glide . PR100X Core: PR100X is an acrylic-based, high-performance Rohacell foam core, that was developed for extreme strength-to-weight applications in aeronautics. Reinforced with Triaxial Braiding Technology, the PR100X has extremely uniform density with no resin absorption, resulting in a super lightweight core, and excellent snow dampening abilities. 3DConstruction: 3D Construction is the unique process of shaping the ski's core to remove weight and channel stiffness and responsiveness in specific patterns for a precise tuning of a ski's torsional rigidity and flex. Triaxial Carbon Construction: Triaxial Carbon Construction contains a higher carbon content surrounding the core material. This creates a ski that is extremely lightweight, torsionally stiff, and lively. Madshus uses this construction on all Champion Series racing skis. Triaxial Braiding: Still the best-known process of applying fiberglass to a ski's core, Triaxial Braiding consists of weaving interlocking strands of glass and carbon fibers into a braided sock around the entire core. This unique method of production yields a close fit of materials and produces excellent torsional rigidity and strength while maintaining a lively feel and light weight. P200 Base Black: The all-new P200 Nano Base family is a further development of their renowned base materials. The properties and variations of snow are almost infinite, so the different materials that make up P200 Nano Transparent, Black, and Nano Zero base are unique to achieve the best racing skis possible. NIS (Nordic Integrated System), allows for the quick and easy removal of NNN bindings. Make micro adjustments out on the trail and dial in your performance.